For November, I plan to use this space to try out different things, like recipes or going to a new place to have my car serviced, finish my holiday shopping, anything really that I need motivation and accountability to DO. I get bogged down and think too much this time of year, and procrastination gets the best of me. This often leads to extreme anxiety or mild depression. Plus, I like to try new things, and what better space to get things out of my head and share than here. So. . . Halloween is behind us, and I don’t know about you, but I spent entirely too much time yesterday raiding the kids’ plastic pumpkins. Mini-Snicker bars are kind of like health food bars, right? We’ve needed to re-group and eat better for a while now, but the annual Halloween binge pushed us over. I’m one of the lucky few who doesn’t gain weight that easily, but ingesting crap makes me edgy and tired and creates blood-sugar spikes and dips that make me a big crabby delight to be around. 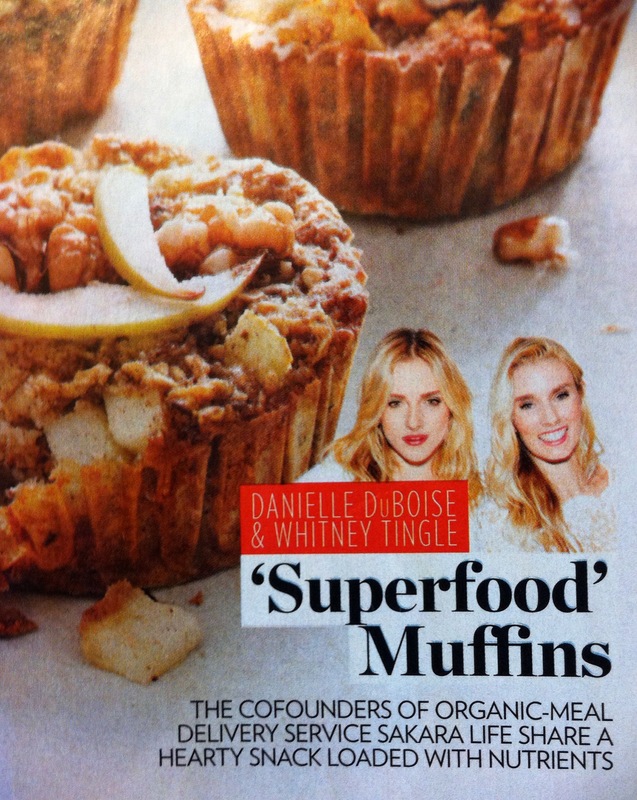 I ran across this muffin recipe as I was flipping through the November 9 edition of People Magazine featuring Khloe Kardashian on the cover. ***Edited*** — I substituted 3/4 cup applesauce for the bananas, and 2 tbsp pure maple syrup for the raw honey. The texture was fine, but I think the original recipe would make a slightly sweeter muffin. See muffin review here. Preheat oven to 400 degrees. Line a 12-cup muffin tin or lightly grease with coconut oil. Pulse 1/3 cup oats in a food processor until it’s the consistency of flour. Combine the processed oat floor, 1/2 cup whole oats, baking powder, baking soda, salt and cinnamon in a medium bowl. In a large bowl, mix eggs, honey and mashed bananas. Add dry ingredients to banana mixture; stir until combined. Fold in apples and walnuts. Fill muffin tins evenly, and garnish with additional apple slices and walnuts, if desired. Bake for 18-20 minutes or until baked through. Remove from muffin tin, and cool or wire rack. They look easy enough. I prefer whole food recipes without a lot of additives, but I also don’t love spending long hours in the kitchen. Sigh. Most likely I’ll double the batch. I think these will be an excellent, quick breakfast for the kids that we can grab as we’re rushing out the door. Do you have any recipes that you love? Please share! What actions are you taking this month? Sounds delicious! Will have to try these. Enjoy! I need to make these again. It’s been a while and the kids and I loved them. I tore this recipe out of my issue of People as well. I made it as the original recipe instructed (Bananas and Honey) and they were really good. I had them for breakfast this morning and did smear some almond butter on top. Very very tasty! I think I’ll store them in the fridge. The apples are really moist and I think they would likely go bad quickly if left out. I just hopped over to WordPress and your comment popped up! That’s neat that you tore it out, too! I’m planning to make my second batch today. I got ripe bananas AND actual raw honey at the store last night, so I’m pumped to try the original — even more so after reading your comment. Thanks! It’s going! lol I’m still figuring it out as I go along. I’m trying to ride the wave, thanx for asking.